A trail or game camera can be an invaluable tool for hunters. Instead of spending hours sitting uncomfortable in a tree or hunting blind to see which animals are frequenting the area and where they like to gather, you can simply set up a trail cam and let it do the work. All you have to do is look at the pictures and decide where you want to hunt. There are several types of scouting cameras available on the market and finding the right one can be confusing. In this guide you will find informative tips and brief game camera reviews that will make it easier for you to choose the best trail camera for the money.Each of these models has its own advantages, and is designed to be used outside. Maybe one of these game cameras is exactly what you need to see what animals are roaming around your favorite hunting spot. This wireless trail camera is designed for use outside, and comes with a durable construction. It is water and weather resistant so you never have to worry about leaving it out in the elements, and since it is manufactured by Buck Commander you know that you are getting a quality product for your money. It’s compact design and camouflage pattern make it easy to hide, which is always an advantage when you are trying not to startle any potential game in the area. There are 36 LED lights with a flash range up to 80 feet, so you can easily capture anything moving in the area. The bright flash also provides you with brilliant color shots, even in the dark. You never have to worry about running out of memory storage with this trail camera, since it is capable of accepting 32 GB SD cards. This is particularly useful considering you can capture photos and 30 second videos. The USB cord lets you connect the camera to compatible devices, and save battery power. You only need 4 inexpensive AA batteries to power this camera through the night, and when this is combined with its affordable price it’s not hard to see why the Nano 10 is often considered the best wireless trail camera. There is very little not to like about this game camera, including its durable construction. It is manufactured by Steal Cam, one of the leading names in the industry so you can rest assured you are making a smart purchasing decision. It comes with a sturdy case that will protect the sensitive internal parts from the elements so you can safely leave it out in almost any type of weather. You will appreciate how crisp and clear your photos turn out, even at night. With 8 mega pixels you can capture high resolution images that clearly show what is wandering around. The flash has a maximum distance of 80 feet so very little gets by the camera, and you also have the advantage of being able to record short video clips. The blur reduction technology allows the camera to take motion shots, which makes it ideal for use above a heavily traveled game trail. With a reflex trigger of .5 seconds, this camera can instantly snap one picture after another. An SD card ensures that you have plenty of memory, and you can even protect your images from prying eyes with the secure password protection. You will always know what type of game animals are in the area with this trail camera. Its sturdy construction is designed to last through all types of weather, but that is not what makes this game camera truly stand out. It has 10 mega pixels for amazing high resolution images, and it is also one of the reasons it is considered the best deer camera. Not only can you capture crystal clear images in any lighting, this game camera will also record short videos up to 180 seconds. It is even able to record audio so you can create clips to share with friends and family. The time lapse function allows you to set the camera to snap pictures at set intervals, which can help you see anything that might not set off the motion sensor. The SD card slot built into the camera ensures that you have plenty of memory, and you will also appreciate being able to securely lock it with the password protection feature. Easy and convenient to use on or off the trail, this game camera might be exactly what you are looking for. The camouflage design makes this game camera easy to hide outside, and it also comes with a durable construction that can withstand almost anything. You will love how clear your photos come out thanks to the 10 mega pixels, and since this camera has anti blur technology it is the perfect choice to hang over a game trail. It will capture moving images without any problems, and you can see once and for all what type of game animals are traveling up and down the trail. You have the advantage of the .067 second trigger speed, which ensures very little will get by this camera. Since the camera can take pictures one after the other you don’t have to worry about missing any of the action. The 10 mega pixels also allow you to take HD video, which is always an advantage. The time lapse function lets you set the camera to take shots automatically, and with a 100 foot range this camera can capture almost anything in the area. Connect the camera to almost any HD TV and watch your videos on the “big” screen, and share your favorite hunting memories with anyone who wants to see them. One of the first aspects you’ll notice about this game camera is how easy it is to use, along with its durable construction. Like all Browning products this game camera is weather resistant, and can be easily left outside overnight. Its long battery life ensures that it is capable of running all night, and since it uses 8 AA batteries that replacement costs are relatively low. You will love the fast .067 trigger time that ensures you don’t miss any of the action. This is especially convenient if more than one game animal wanders into the area at a time. It also has a flash range of 60 feet, so you can get a good idea of what is in the area. To ensure that nothing is missed, this trail camera can even be set to take pictures at specific intervals. Record high definition videos with the camera, along with sound and share the clips with family and friends on a HD TV. With 8 mega pixels to ensure high resolution images, you will be pleasantly surprised at the quality of your images. Often considered the best cellular trail camera, you will love how easy and convenient this model is to use. It will connect to the approved wireless network so you can instantly see your photo as soon as the camera snaps it. Not only does this give you instant access to the pictures, it also stamps each one with the time, date, temperature and phase of the moon. This gives you a distinct advantage when it comes to tracking prey, and it also helps you plan where you want to place the camera next. This cellular trail camera comes with a convenient 2 inch viewer so you can immediately see your pictures without having to transmit each one to a compatible device, which is always a bonus when you are hunting in a remote area. The LED lights are designed to not emit a glow so you can take pictures without startling the game. With 12 mega pixels to ensure crisp, high resolution images and a durable construction it is easy to see why this trail camera is a popular choice with hunters. You will find very little not to like about this game camera, including its price. Since it is manufactured by Browning you know that it is durable, dependable, and a good choice for almost any outdoor setting. It is capable of supporting 32GB SD cards, so you have plenty of memory for the photos and video. You will need the storage space since this camera is capable of taking up to 10,000 pictures on 6 AA batteries, which is more than enough to capture everything in the immediate area. The long battery life has the added advantage of helping you save money on replacement costs. With a flash range of 100 feet you can easily capture game animals up close and at a distance. The camera also has a fast trigger speed so you don’t have to worry about missing any of the action. 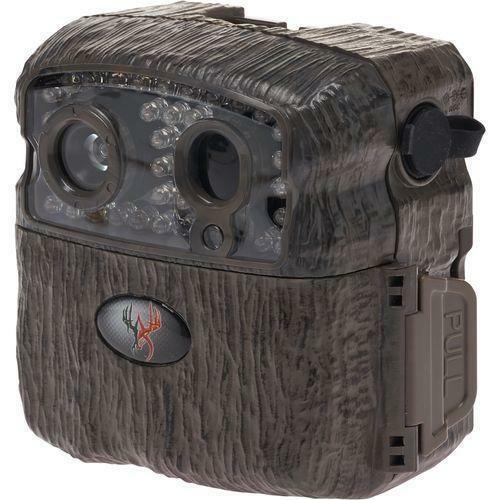 With the camouflage pattern on the camera you can easily hide it in the woods or around a clearing, and the infrared flash won’t startle any animals that might be nearby. Capture still photos and high definition video with the 10 mega pixels, and never wander what type of game animals you might be missing with the BTC-5 trail camera. With its durable, all weather construction that is backed by a one year warranty, you know that this game camera can withstand almost anything. The sturdy case is weather and water resistant so you can leave the camera out overnight without any worries. The long battery life ensures that you have plenty of power, and it will also help you save money on replacement costs. You will also appreciate the realistic camouflage pattern that lets the camera blend in almost anywhere, along with the infrared flash that won’t startle any animals that might be nearby. The infrared flash can capture images up to 50 feet away, and produce high resolution black and white images. As an added bonus it also comes with “Buck View” advanced software for Windows OS so you can easily track game movements and find the best places to set up the camera. You will love how crisp and clear photos turn out, and the Hyper Fire HC500 is also capable of capturing up to 2 frames per second. This ensures that you can see everything that comes into view, even when more than one animal is in the area. With plenty of memory and the ability to capture high definition images, it is easy to see why this game camera is a popular choice with hunters. Experienced hunters often turn to the M-990i when they need a dependable game camera that is capable of capturing high resolution photos and video. The camouflage design is perfect for hiding from view, and the durable construction ensures that it can handle almost any weather condition. You will also appreciate how easy this game camera is to use, along with the long running time. With 10 mega pixels you will be able to clearly see every detail, and the infrared flash won’t startle any nearby game animals. It also has a distance of 70 feet at night, so you will know exactly what type of animals are in the area. The fast trigger response ensures that you can easily capture all of the action, and with the ability to take a shot in less than a second you can even capture images of more than one deer at a time. This game camera also comes with motion freeze capabilities which will eliminate any blur caused by moving animals. As with most game cameras from Browning you have the advantage of the included “Buck Watch” software, along with the time lapse function that lets you set the Recon Force XR to take pictures at regular intervals. You can watch the action as it unfolds, and see when and what types of animals regularly appear in the area. This also makes it easier to track the movements of potential prey, and can help you find the next spot to set up the camera. You will love the convenience of the long battery life, along with the fact that this also helps you save money on replacements. The flash is capable of illuminating images up to 100 feet away, and with a trigger speed of 0.67 seconds this camera can easily capture anything that wanders into view. You can even record video and short clips with audio that range in length from 5 to 120 seconds in length. The Recon Force XR is designed to be easy and convenient to use, and since it is manufactured by Browning you know that it is made to last. See exactly what type of game is in the area, and with the anti blur technology you can even track prey as it is moving along the trail. Game cameras can come with several features which can affect the overall price. Some of these functions are necessary, but others might not be worth the extra cost. This buying guide will help you find a trail camera that comes with the features you need. As stated in the trail camera reviews one of the first aspects to consider is the flash. Since most of your pictures will be at night or in low lighting this is also one of the most important features to consider. There are two types of flashes to choose from, and each comes with its own advantages. While an infrared flash won’t startle animals with a bright light, it is only capable of capturing images in black and white. Incandescent flashes are capable of taking clear color photos even at night, but the bright light emitted often startles animals and uses significantly more battery power than the infrared. This refers to the area covered by the camera, and it can make the difference between a great and barely functional model. The width and distance specified in the product description will let you know how much area is covered by the camera. This is important if you want a relatively accurate estimate on the number and type of animals in the area. The best trail camera will have a high resolution, but this will also be determined by your budget. Inexpensive models generally have a resolution of 3 to 4 mega pixels, while mid priced game cameras are capable of taking clearer images with 5 to 7 MP. Some of the top rated trail cameras boast 8 to 10 MP which is capable of taking amazingly crisp and clear images, but it also comes at a higher price. You definitely want to pay attention to this feature, which can determine how effective the camera is at determining what types of animals are roaming around the area at night. The trigger and recovery speed refers to the amount of time it takes the hunting camera to capture an image after the heat or motion sensor has been tripped. If the recovery time is to long chances are you will miss part or most of the action. Some of the best game cameras have a trigger speed and recovery time of one second or less. This is one feature that you want to pay attention to or you could find that your game camera ran out of power in the middle of the night. The cameras can be powered by AA, C, or D batteries and there are some that use 6 or 12 volt batteries. Cost will often affect your decision, but it is important to remember that the best game camera for the money might be the slightly more expensive one with a long battery life. Not only will this save you time and money on replacement costs, it also ensures that the camera will have plenty of power to stay on all night. Another aspect to consider is the type of flash. Incandescent flashes will use more battery power than infrared ones, which will affect the running time. This is often seen as an extra feature that is nice to have, but the game camera reviews state that consumers who pay extra for a built in viewer seldom regret the small added cost. This convenient option lets you check the pictures without taking the camera out of the woods, which is always nice if your favorite hunting spot is far from home. Trail cameras can come with an internal memory or use a SD card. While internal memory is convenient and does not require the additional purchase of a card, the size of the available storage space is usually limited. It can also be a hassle to transfer the images to your laptop since you need to physically attach the camera. A SD card will provide you with more storage and it definitely makes it easier and more convenient to load images onto your computer. While the memory card does cost extra, it is often worth it in the long run. This is another feature that is nice to have, but not necessary in all situations. Some wildlife cameras will also record video, which lets you share short clips with family and other hunters. It should be noted that not only does the feature add to the final cost of the camera, it can also take up a lot of storage space and easily drain battery power. There are some additional features to consider, and not every one might be convenient or practical for you. Some game cameras come with a tiny laser pointer that lets you see exactly where the lens is pointed. Other models come with a fun “burst” feature that will allow the camera to take 3 or more shots at a time, but this can quickly run the battery down and fill up any available memory space. GPS tagging makes it easier to track movements and find the right place to set up the camera, while models that come with a date or time stamp ensure that you know everything about the prey in your area. Not only will this feature stamp the image with the date and time, but also the temperature and phase of the moon. This extra feature is ideal for serious hunters. Motion and frame shutter freeze capabilities are nice if your camera needs to take pictures of moving game, but it is often not worth the added cost unless you are trying to photographic a well traveled trail. Other cameras come with a time lapse function which can be set to automatically snap photos at specific intervals. Even though the majority of these features are not exactly necessary, most are nice to have. If your budget can affordable the higher price many of these features bring, it might be worth it after a successful hunting trip. Trail cameras can save you a lot of time looking for the perfect hunting spot, and these convenient devices are generally easy to operate. Now that you know which features are available, you will find it easier to find a game camera that comes with the ones that you need. There are several types of game cameras to choose from and each has its own advantages. Once you know the type of cam that best suits your needs it will be easier to find the right one. A cellular game camera will record and transmit images directly to your phone or other internet enabled devices. You will need to purchase a SIM card and possibly a data package, but these cameras are great for hunters who can’t wait to see what animals are in the area. Some of the newer models also come with motion sensors, and while this does add to the price it is a nice feature to have. In generally cellular cameras are compact and easy to camouflage and install, though it is important to remember there could be extra costs involved. These are often considered some of the best trail cameras, as long as the area covered is wide enough. Models that are motion activated are generally non invasive, and are designed to take a picture without startling the prey. It is important to make sure that the camera is sensitive enough to detect small movements or you could miss capturing all of the action. You also want to check the measurements listed to ensure the coverage is wide enough for the area you are trying to see. These cameras are also a great choice for use in areas that might be hard to reach or considered too dangerous to spend a lot of time in. One of the biggest advantages associated with this type of camera is how easy it is to operate. These wireless cameras are also non invasive, and can be easily camouflaged. You also have the advantage of being able to immediately share pictures online with family and friends via the Wi-Fi connection. These cameras come with a transmitter built in, and can be easily used indoors or outside. It should be mentioned that the network connection might not always be stable outdoors, and it does need to be strong if you want to be able to transmit photos online. There is also a risk of cyber attacks, so you do want to be careful of what images are transmitted. These cameras can be found in a range of prices and are extremely versatile and functional. While not every portable security camera is designed for use in extreme outdoor conditions or as a wildlife camera, it is capable of capturing clear images of the action in its immediate surroundings. If you are lucky enough to have a hunting cabin out in the woods or a well made blind and are worried about the activity that goes on when you are not there, a security camera might be exactly what you need. According to the trail camera reviews it can be camouflaged or set out in the open. This can be especially helpful if you are trying to deter intruders or prevent vandalism. Some of these cameras can also record quick video clips, while others are Wi-Fi enabled and can transmit images in real time. It is important to chose a security camera with an infrared flash, otherwise the bright light that appears every time a picture is snapped might have the opposite effect and draw would be thieves in. There are several reasons why you might want to use an infrared trail camera, especially if you are trying to capture wildlife photos at night. Instead of a bright flash that often scares animals away, there is only a small red dot of light when a picture is snapped. These cameras also have an impressive battery life that can generally last throughout the night, and come with a durable construction that makes it perfect for use outdoors. Infrared cameras often come with light sensors, and are capable of taking high resolution shots. It should be noted that these cameras are often priced slightly higher than other models, and generally are only able to capture black and white images at night. The first aspect that you will notice is the inexpensive cost of the camera, along with how easy it is to operate. These cameras are generally designed for durability and to be easy and convenient to carry, which makes it a great choice for hunters who frequently wander far from home. Most models come with an automatic flash so you can use it during the day or night, and even though it does come with a relatively low price it is still capable of capturing crisp, clear images. The main drawback of these cameras is the flash, not only can the bright light startle animals some models also make a slight noise when the picture is being snapped. Neither of these is ideal when you are trying to see what is roaming around at night. NOTE: It is important to review the laws in your area, especially if you are planning on installing a security camera. While it is illegal everywhere to mount a camera by a restroom, the laws concerning other areas is different depending on where you are. It is also a good idea to remember to periodically erase the memory, especially if the camera is recording in real time. Even though it is primarily used to see what game is in the area, it is still possible for these cameras to capture a moment or two that you would rather not share. Even if you know what type of game camera you are looking for it can still seem almost impossible to choose one that fits your needs. To help relieve some of the stress and make your decision a little easier here are some buying tips that will help you choose a game camera. While you don’t need to know how to take a game camera apart and put it back together, understanding a few of the basics can help making shopping a little easier. You will want to look at the detection circuit which determines the width and length of the area it is capable of covering, along with the amount of time it takes to recover after snapping a picture. How many batteries and the size can affect the overall cost of the camera, and you also want to make sure that the infrared flash is capable of taking clear photos at night. Picture quality and whether it has a viewing screen are two other basic features on a game camera that you should look at. It is not uncommon for first time buyers to make a decision based on the number of mega pixels, but this might not always give you an accurate idea of the picture quality. It is important to remember that the majority of your photos will be taken at night, and a high number of mega pixels usually mean crisp, clear photos on a game camera you want to look at the flash. Many hunters recommend using infrared flashes since these are capable of capturing high resolution shots without the bright light that can startle game. The only potential downside is that all of your nighttime photos will be in black and white, but you will still be able to see every detail of the image. The other type of flash uses a white or incandescent light. While this does result in bright color photos with little glare, the flash can startle animals away from the area. The other problem with white and incandescent flashes is the bright light can draw would be thieves and vandals to the camera. Most trail cameras clearly list the measurements of the detection zone, along with the trigger and recovery times. This is something you need to carefully consider if you want to avoid a potentially expensive purchasing mistake. These cameras are generally triggered by heat and motion, and you want it to immediately snap a picture and be ready for the next shot. Most experts recommend spending a little extra on a game camera that has a short one second or less trigger and recovery time. This means that in one second the camera will have snapped a photo when heat and movement are sensed, and be ready for the next one in this short period of time. This is especially helpful if more than one animal is wandering around in the detection zone so you get a clear idea of what is in the area you are planning on hunting in. You also want the detection zone to be wide and deep enough so it can easily detect any game. Many consumers forget how important battery life can be, until they find that their game camera ran out of power before it could capture any images. While you might pay more for a camera with longer battery life, it will be worth it in the long run. As an added advantage you won’t have to spend time and money replacing the batteries as often. You will also want to decide on the number and size of batteries needed, and this will generally depend on the type of flash and included features. Most game cameras are compatible with AA, C, D, 9V or 12V batteries, and the right one for you is often a matter of personal preference. It is important to remember game cameras with incandescent flashes and ones that can record video clips or in real time will use more battery power than other models. When you are looking to buy the best wildlife camera for hunting it is important to check brand quality. Information gathered from consumer and expert reviews can help you choose a game camera from a reputable brand, and your fellow hunters can also be a great source of advice. They will know which brand can withstand the outdoor weather, and whether it is worth your hard earned money. You can find game cameras in sporting good stores and hunting supply shops, and also online. If you do plan on buying your trail camera online then you will want to take a few minutes and make sure that you are dealing with a reputable seller. Comments from other customers , along with sales ratings will let you know whether you can trust the seller or if you need to find another one. With the information included in this guide you can confidently choose a game camera that fits your needs and budget.